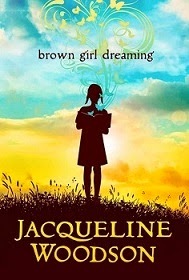 Brown Girl Dreaming is a memoir in free verse about Jacqueline Woodson’s childhood in 1960s and 1970s South Carolina and Brooklyn. It’s also about her family, their history, and how it ties to wider historical events; the ripple effects of the Civil Rights movement and how they shaped her life even before she fully made sense of them; and growing up as a black girl who loved stories in a world that didn’t always acknowledged she got to have one. It’s lovely to think that the book where an adult Jacqueline Woodson now tells this story will surely have the same effect on other children. This mission is what’s been passed down to me — to write stories that have been historically absent in this country’s body of literature, to create mirrors for the people who so rarely see themselves inside contemporary fiction, and windows for those who think we are no more than the stereotypes they’re so afraid of. To give young people — and all people — a sense of this country’s brilliant and brutal history, so that no one ever thinks they can walk onto a stage one evening and laugh at another’s too often painful past. Brown Girl Dreaming was a great follow-up to some of my other favourite reads of 2014, namely March: Book One and Rita Williams-Garcia’s novels. I like how they all explore the real, everyday lives of people who go through periods of great social change, and also the circumstances in which someone might decide to take a stand or not. This is an idea I keep coming back to, I know, but I find stories that explore it illuminating. I’m very interested in reading about how people whose reality is inevitably shaped by disempowerment resist it while keeping corners of their lives that are simply about being a person. Oppression can be simultaneous all-encompassing and not the be-all and end-all of someone’s existence. On the bus, my mother moves with us to the back. to make her move. Not with us. Not now. shirt, tie, and my brother’s head shaved clean. and safe places to gather. lemon pound cake into generous pieces. Revolutionary social movements wouldn’t happen without people like Miss Bell, who stand behind those on the frontlines and provide crucial support. More often than not their contributions end up being erased, all because they’re not what we have been taught to recognise as heroic or brave. It’s always wonderful to come across stories that deliberately set out to counter that. I found Brown Girl Dreaming hard to read in public because every so often I’d come across a poem or a few verses that would make me tear up. Another wonderful book from a writer who has yet to fail to impresses me. I love books written in verse and need to get my hands on this one. After reading so many wonderful reviews on Goodreads, this book certainly caught my attention. Your review cinches it. I need to get a copy - my own. Thanks for this special review! Kathy, I'll have another novels in verse rec for you next week! Grad: Aw, that's really nice of you. I'm glad to have persuaded you and I hope you enjoy the book! I am not sure whether I am a fan of books in verse, but this sounds lovely. Several people have recommended this author for me and/or my kids to read. I really want to read this. I kind of wish I had got it with my Christmas gift cards, but I had so much I wanted. I will hopefully get it this year! In my own review of this book I admitted that I am Woodson's age but have no consciousness of living through the events she describes, since my life was not directly affected by them. That made the book powerful for me, along with the parts about becoming a storyteller. And your review, too, of course. I found this book so powerful and beautifully written. I think I should get a copy for myself. I really enjoyed listening to it on audio, but it is so quotable, I want it for myself. And here I am tearing up as well, just from reading the poem about Miss Bell. I have been resisting this as I am not suuuuch a novel-in-verse kind of girl, but per usual you are making it sound unmissable. I rarely read verse, but the excerpts you've provided seem remarkably poignant. I may have to pick this one up. Irena McKenna: I hope you'll give it a try anyway - the narrative is really engrossing and you'll likely forget all about the format! Kelly: Yes, there was so much I wanted to get but didn't, even with generous gift cards! Jeanne: I went and reread your post and it's so great. Aarti: I bought it in hardback, which I don't do very often, and I don't regret it at all. Definitely one to keep. Jenny: Read it, read it! I think you'll like it a lot. Trisha: But it's narrative verse! I really think you'd like it. Marie: It deserves all the praise and all the awards!